Extreme Hills indeed look cool, but they are just that - hills. Such hills simply get boring after a while - there is very few flat places to build on and admire the scenery. This biome offers a flat place to build, a pop of color to the drab blue-green of the mountains and possible Villages hidden within the treacherous slopes. 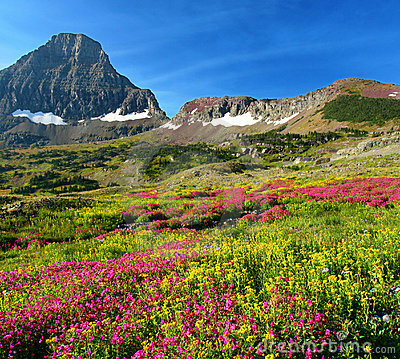 The main feature of the Alpine Meadow biome is the sheer amount of flowers. Each Grass block exposed to air has a 98% chance of spawning a random 1-block high flower, a 1% chance of having a Spruce tree, and a 1% chance of spawning Tall Grass. The other main feature is the flatness of the Meadow: The terrain is restricted to generate at bands of height 81-83, 115-117, 156-159, and 200-203, depending on the average height of the biome. This restriction applies even to the AMPLIFIED generation option, much like Swamps. Lastly, the size of this rare biome is roughly the same as Flower Forests: roughly 200 square meters in area(?). The flatness of the Alpine Biome serves as a valid candidate for Villages to generate in this biome. The main material for these Villages is Spruce, unlike the regular Oak wood used for the villages. They have the same characteristics as the other Villages. could you make some screen shots of it? Essentialy, the Alpine Meadow is the Flower Forest of Extreme Hills, and has the same rarity as such. Support, but I think it should only spawn the light colored flowers.